In a large saucepan, bring rice milk and coconut milk to a boil over medium-high heat. Cut vanilla bean in half and add to pan. In a small bowl, mix together the agar-agar and arrowroot starch with a little water until smooth. Add agar-agar mixture to saucepan and whisk to incorporate; bring to a boil for approx. 1 – 2 min. Add cashews, liqueur, salt, vegetable oil, agave nectar, and rice milk mixture to blender; mix on high speed for approx. 1 – 2 min. until smooth and creamy. Pour cream into small jars for serving; refrigerate for approx. 3 – 4 hrs. until cooled and set. Add two-thirds of the raspberries to a small saucepan and bring to a boil over medium-high heat to defrost. Add warm raspberries to blender, as well as dates and lemon zest. Mix on high speed for approx. 1 min. until smooth. For a smoother finish, strain sauce through a sieve and discard large pieces of fruit. Return raspberry sauce to pan and reheat over medium heat. Add remainder of frozen berries to blender and pulse for approx. 10 – 15 sec. 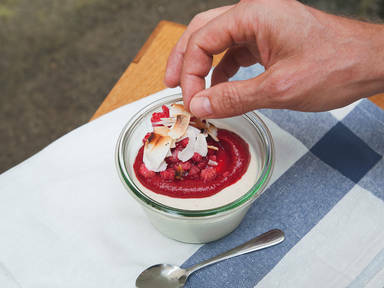 Garnish cream with raspberry sauce, frozen raspberry pieces, and toasted coconut flakes, if desired. Enjoy! Dieses und weitere schnelle Rezepte von Sebastian findest du in seinem Buch Fit-MIX (SZ Verlag).